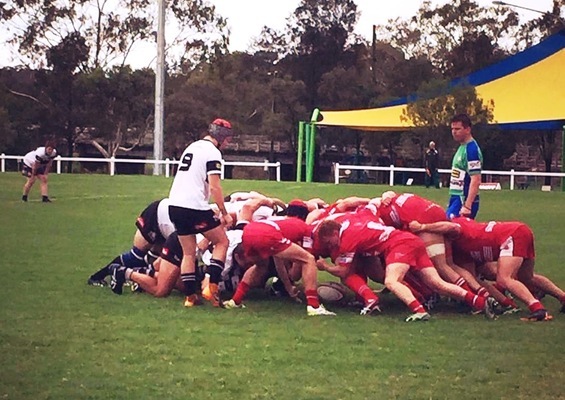 Strong scrummaging was a highlight of the Water Rats win over St George on Saturday. The Water Rats looked like they would have to live up to their name on Saturday as rain teemed down prior to kick off in the game between the Rats and St George in Warwick. A big contingent of St George players made the trip to Warwick and many said it was worth it just to see the rain. The rain eased in time for kick off and the first hit was a monster. Luke McGahan take a bow it was almost the hit of the century and you lived to tell the tale. It was the start that the visiting Frillies were looking for and allowed them to pile on pressure early in the game. Things looked grim for the Rats who were down 12-0 only a few minutes after kick off. The Rats shored up their defence and staged a spirited comeback. Critical to the cause was the power of the Water Rat’s scrum. It was a real contest and the St George pack, renowned for their size and toughness stuck it to the Rats. However, the Rat’s managed to get the edge in the battle. It gave the team a chance to dominate territory as the half wore on. Penalties were converted into excellent meterage by Charlie Brennand and the improving lineout had a very tidy game. Poor ball possession did however give the Frillies plenty of chances and Lachy Winten who had another great game at fullback, was forced to dive on a loose pill when the Frillies could easily have scored. Minutes before half time the Rats had their chance. Once again it was the brute force of the forwards, keeping it in tight in the slippery conditions which led to Jonny Winter crashing over for a crucial try before half time. The conversion successful as the half-time whistle blew and the Rats were back in the hunt. Early in the second half the Rats crossed again from a slick line-out and a trademark driving maul. Vlad Savovski getting the glory after the boys almost sprinted to the line with ease. In another nail biting finish the Water Rats trailed 14-9 with minutes left in the game. Chuck Brennand saw an opportunity to pounce, took a quick tap, stepped a couple of props and sprinted from the half way to score under the posts. Brennand converted his own try to set up some nervous minutes for players and supporters before the full-time whistle. The Rats held their nerve and scored a tough 21-19 win. It is a long way to come from St George for a footy game but the Frillies put a hell of a fight; well done to their players. The Rats have been hit with injuries in the opening games and with playing stocks low the team welcomed Michael Coleman and the returning Rat Alex Costello who boosted the playing squad to 17. This weekend is another tough assignment as the Rat’s make their first away trip of the season to take on the Toowoomba Rangers on Saturday. Sure, to be all hands-on deck this week at training.